Designed to activate, orchestrate and energize, this biologically-advanced concentrate is infused with the highest daily percentage of Age-Repair Defensins™ to create new skin cells. Results are equal to 8 separate serums. By promoting increased skin cell turnover, this specially formulated tretinoin brightens, lightens and improves the texture and tone of skin all over the body. Not recommended for the face. A blend of natural and copper bristles, this top-of-the-line body brush stimulates lymphatic flow and circulation, and exfoliates skin. We've also included a sample of our favorite hand cream, RESTORSEA REPAIRING HAND TREATMENT. 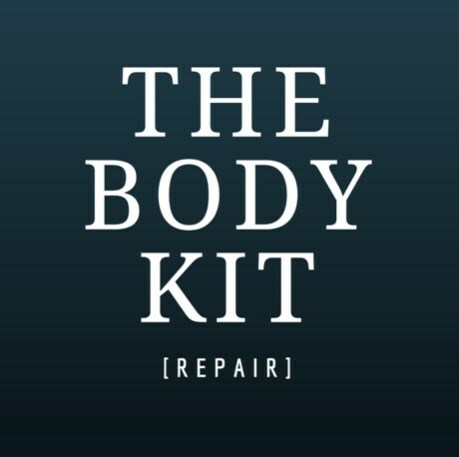 WHO IS THE BODY KIT [REPAIR] FOR? 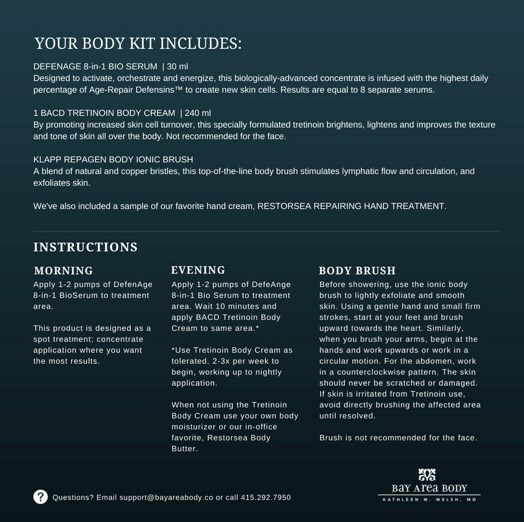 Anyone looking to correct loose skin, crepiness, pigmentation and general signs of aging on the body. An excellent compliment to body sculpting procedures, our patients like using this kit for arms, above knees, back of thighs, abdomen (especially for post partum laxity) or anywhere else gravity has taken a toll. Instructions are included in the kit. Due to FDA rules and regulations, we cannot sell prescription products to patients unless they have seen one of our prescribing providers within the past year. Please note all prescription products are non returnable.